Welcome to the official website of the company William Leistner GmbH & Co. KG. The company Leistner is a manufacturer of William Leistner horse grooming brushes for equine care. Brushes for horses are produced in unique large variety of the best materials for many decades. The appearance and color of wood, bristles and straps are exactly matched. We have more than 170 different horse brushes and brushes from our own production for our customers in stock. We process only very high quality materials. You always get the best quality from us. If there is to read at our brushes "100 % horsehair" or "100 % bristles", you will get 100 %. Unfortunately, the competitors call their brushes also "horsehair brush", but in these are often only 20 % to 30 % horsehair or cow hair contained. And by horsehair there are big differences in quality. We use only the best qualities from the horse tail, not from the mane or or even with cow hair. This explains the price difference. Please call particular attention to our marvelous brushes, which are produced only by us, like "Shiny" with bright tips, brushes with Brandmarks, the brush "Ultimate", as well as the new series "Feltie" and also with protective rights, as well as the "Wonderbrushes®" and the Two-Way brushes. The brush bodies do not only have a beautiful grained pattern, but they have also a perfect shape to fit in to the hand and give a comfortable feeling even at low temperatures and wet weather. Plastic is generally believed to be more hygienic. Exactly the opposite is the case! Wood, in contrast to synthetic materials has an antibacterial effect, as studies of the Federal Biological Research Centre for Agriculture and Forestry in Braunschweig have shown. For natural products we process 100% pure natural bristles or 100% pure horsehair. The bristles are long and dense. This guarantees the best cleaning results and shine of the coat with gentle, skin-friendly care, as well as a high durability and longevity of our grooming brushes. Our bristles have quality of „90 Tops“. This means, at least 90 of 100 bristles have the whole length. genuine leather (vegetable tanned) 39 different pc. They are hand nailed on to the wooden bodies. If necessary, you can shorten the straps yourself. We emboss a name on the leather strap for you. Daily grooming of your horse isn’t only an annoying work to clean the coat, but it intensifies the bond between horse and rider. The horses feel it as a pleasant massage and man can escape from his everyday stress rather quickly. Moreover the rider can notice changes of the coat/skin or signs of illness which can be treated immediately. Whether before or after riding or for large cleaning, the company Leistner meets all needs with over 180 different horse brushes of own manufacture. The quality of a product is only as good as it‘s materials used. Therefore we only use carefully processed wood from European forests which is sustainably managed. All grooming brushes, apart from one sort of wash brushes, are made from natural wood. The wood is available in brown grained, clear or colour lacquered or a natural finish. In our organic series, they are treated with beeswax. Our synthetic bristles are made from PPN, they are of very high quality and stay in shape. Coat and skin of the horses are thankful for a care with a brush with pure horsehair or pure bristles. 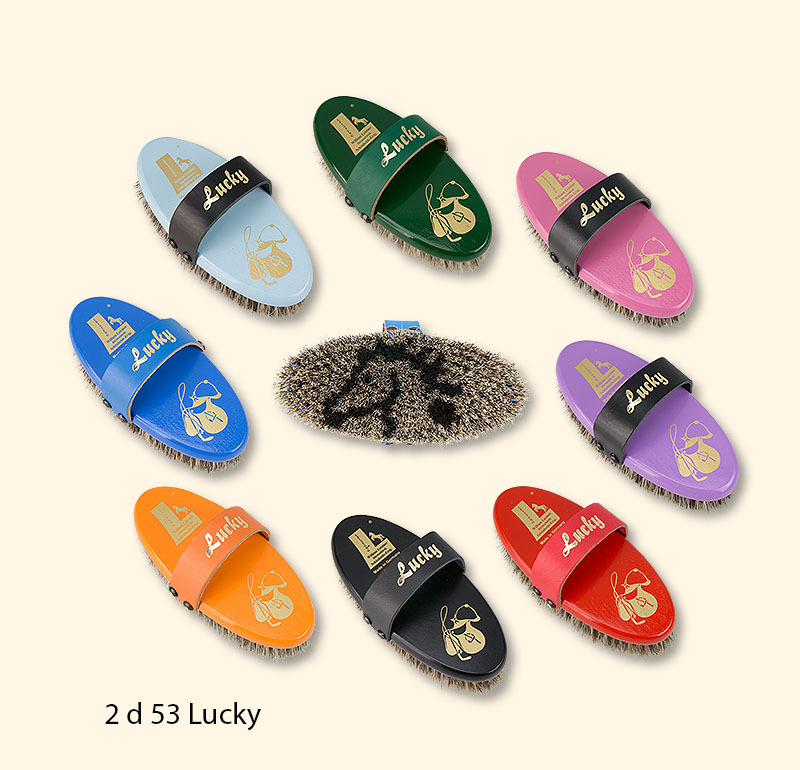 For example as a bestseller with horsehair you can buy the brush »Pik As«. If you wish to buy a brush with extra tough bristles »Pik König« could be your one. Another good choice are horse grooming brushes with pure wild boar bristles, which are especially stiff and dense. They remove all dust and draw oil from the coat to the surface for a fabulous shine. You can choose between size b brush »Anthony« or size c brush »Esprit« (Two-Way-Brush). The company William Leistner uses only the best horsehair and high quality bristles from the pig or wild boar for the high quality horse grooming brushes. Horsehair has the advantage of a high resilience, this means it goes back to its original shape. A leistner brush is a durable purchase with appropriate care. 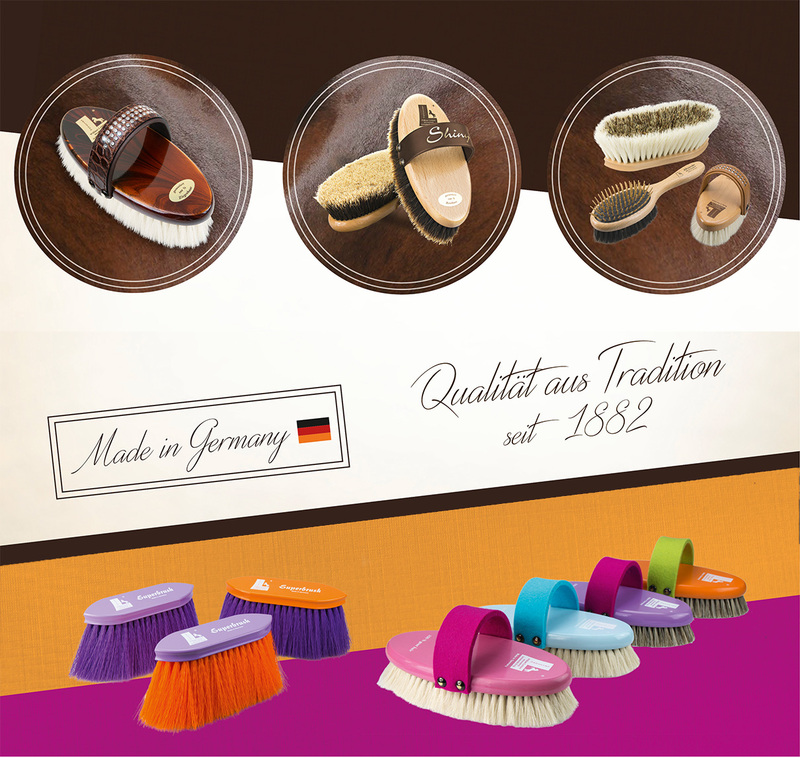 Therefore the company Leistner equips all with pure horsehair reported body brushes with 100 percent horsehair. Pure horsehair also has two other advantages: it doesn’t have sharp and burred edges like synthetic bristles. Furthermore they are not charged electrostatically. 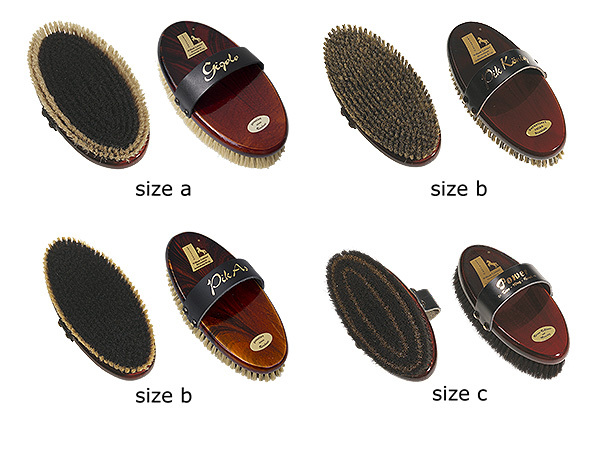 All grooming brushes in size “b” are dome shaped to provide close contact to the coat. The better the product, the better the outcome care. Despite further increases in raw material prices, 41 body brushes of our product range are fitted with 100 % bristles and 100 % horsehair. The extra long and dense bristles get easily the dirt from the coat. There are up to 600 bundles per brush what causes a huge dirt absorption. Pure bristles and pure horsehair can remove significantly more dirt particles than synthetic bristles due to their structure (never as smooth as synthetic bristles). 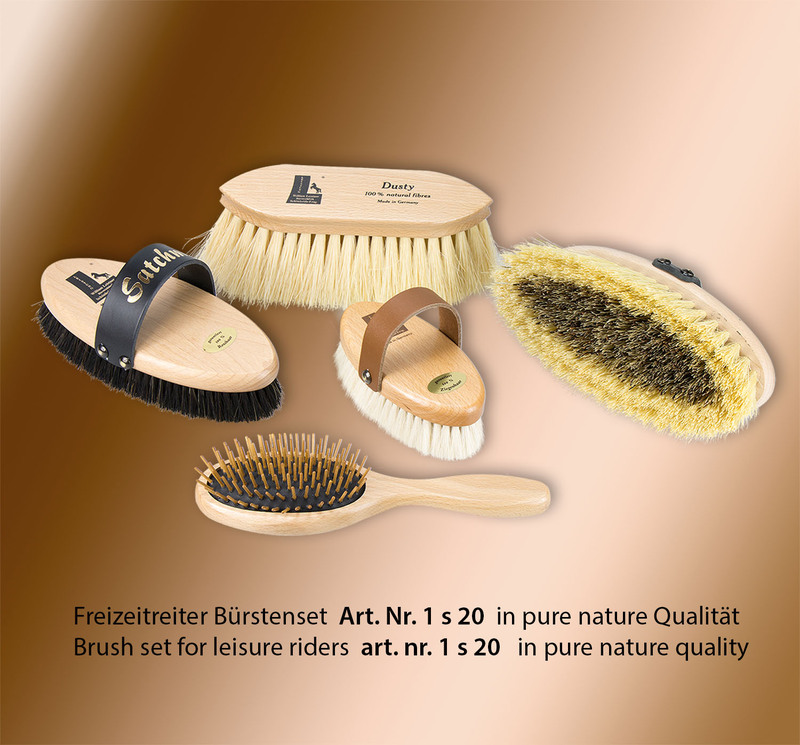 Of course the company Leistner also offers horse grooming brushes with a cheaper horse hair mixture of snythetic and pure horsehair/bristles for example »Ruby« or »Lucky«. But in these the proportion of horsehair/pure bristles is so high that you can see it to the naked eye. Synthetic bristles and cheap mixtures with low proportion of horsehair have a high gloss. Our mixture has a matte gloss because of the high proportion of horsehair. Imaging you buy a horse grooming brush which is fitted with mixtures of bristles and synthetic belts. It also has a premium seal. But this seal does not transform the brush to a premium body brush. How to clean horse grooming brushes? Even natural fibers can significantly absorb more dirt due to the natural structure. So it is necessary to clean the brushes from time to time. Horse grooming brushes can be washed and disinfected without problems even brushes with wooden backs. After wasching them for example with a little bit of human hair shower gel they should be thoroughly shaken and placed on the bristle side for drying. Extravagant: Crocodile leather straps - we use high quality, full grain cowhide which is stamped with crocodile skin pattern. Each belt has a soft elk leather underlining. very comfy: elk leather straps. double-sided, soft padded elk leather provides a unique, super comfortable feeling! The Feeling Brush is anatomically formed, comprising a beech wood back and a soft leather hand strap (can be adjusted in length). This allows the hand and brush to become one, allowing you to groom your horse without your hands and arms becoming tired. The brush takes the chore out of grooming, allowing you more time to enjoy your horse. Made from pure horsehair with a double high pure bristle edge, which removes the last remants of dust and gives the coat a beautiful shine. Registered wooden body design. With Quality pass. The angular bristle position allows a variable handling and ensures a maximum cleaning effect. One way it is used for deep grooming - the other way for a polishing finish! Ideal during shedding season. Two rows horsehair remove the dirt to the skin and the hair goats recent dust in one pass. The result: long-lasting shine of the coat. Convenient in daily use, also ideal for the tournament. Patent angular bristles, ‘Cleans like Magic!’ The taught angular special bristles sink deeply into all gaps, corners and uneven surfaces/ structures to remove the most stubborn of stains. We also offer brushes for dogs and small animals.